Should I Charge Monthly or Annually for My Membership Site? 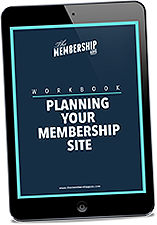 How regularly you charge your members has an effect on generating sales, engagement inside your membership as well as member retention. Not to mention the implications on your business itself in terms of stability, cashflow and more. In this episode of The Membership Guys Podcast, I dig deep into the pros and cons of each type of subscription frequency; as well as present some additional and alternative options for membership billing. Monthly vs annual billing: which is the best option for your membership? Find out now! Should I Charge a One Off Fee or Recurring Payment for Membership?